This Cat in the Hat Cake is truly a masterpiece! With a "hat" design, a goldfish in a bowl, and Thing 1 perched on the side with a kite, the details on this cake are simply exquisite. 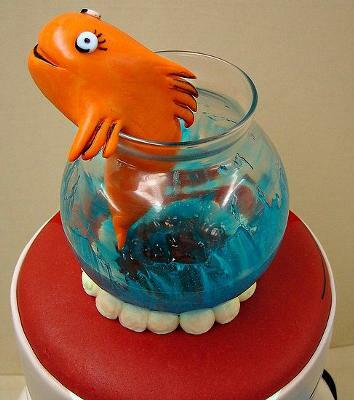 I know that the design of this cake is beyond most of our "cake creating" abilities, but I thought it might give our readers some ideas for their own Cat in the Hat cake such as colors, using unique items such as the fish bowl or adding creative details like the kite and book. 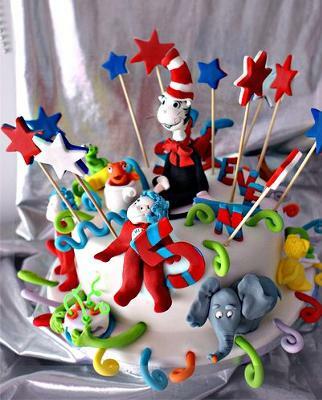 This cake is perfect for a Dr. Seuss theme or Thing 1 and Thing 2 kid birthday party. This Cat in The Hat Birthday Cake is a two tier round perfect chocolate cake with whipped buttercream filling, covered in a generous layer of buttercream and wrapped in a silky layer of fondant. The cake is finished in a custom designed Cat and The Hat Theme. 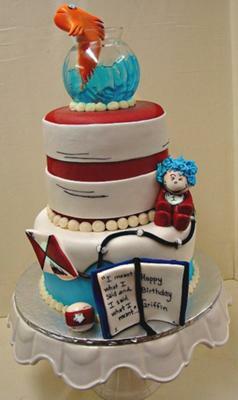 The bottom layer is finished in a sky blue and hand cut white cloud effect with a kite, the classic "Thing 1", a Dr. Seuss book with a Seuss-like birthday message and the red striped ball. The top layer is finished in the "hat" design and is topped off with a hand sculpted fondant goldfish jumping from his bowl. These photos and cake descriptions was generously allowed to be used at Perfect Parties by Jennifer at JMC Custom Cakes. Please be sure to check out her other wonderful creations. An amazing Dr. Seuss Cake with all his wonderful characters. Thing 1 and 2, Cat in the Hat with his umbrella and of course the fish, Horton and the Lorax. If you look carefully than you can see upside down fox in the socks ( behind the cat). It was made with a chocolate cake with ganache, covered with fondant and handmade fondant figures. Figures were done a week before so they are nice and dry to be added to the cake.